It's Yamaha's best-selling electric guitar and it's just got better! Originally the most affordable of the Yamaha Pacifica range (which debuted in 1990, and was designed by Yamaha's USA team, primarily ex-Ibanez designer Rich Lasner), the 112 first appeared in 1993 and not only overtook all previous (and subsequent) Pacifica models in terms of sales, it actually proved a benchmark for quality and specification. Back in the early nineties it was not uncommon to see plywood-bodied guitars in the low-end market. Not so the 112, which was made of solid wood. And not any old lump of tree, but solid alder. To advertise this Yamaha offered the 112 in a natural finish. But it wasn't just the body wood, the Pacifica 112 - from the outset - employed good hardware and pickups and classy design. Early in 2007 Yamaha introduced an upgraded model in all but price. The Pacifica 112 defies inflation and remains at £199 - the same price as it was back in 1993. Let's take a closer look at the current model. While no one has ever disputed the origin of the Pacifica design, its outline is very noticeably different to the Stratocaster. The horns are longer, sleeker and the lower bout appears a little more angular compared to a Strat. 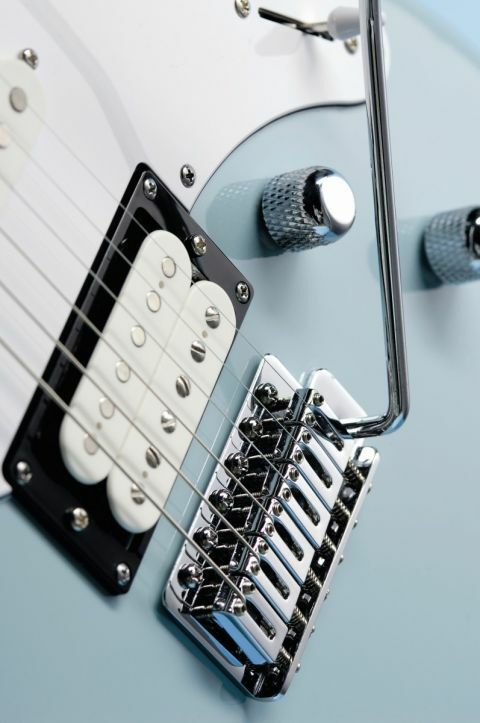 Up to this point in its history the 112 has featured a large scratchplate on to which all the pickups and electrics were mounted - like the Strat, but unlike the majority of other Pacifica models that use a more distinct design with the bridge pickup and rotary controls body-mounted, the other two pickups and five-way selector on the scratchplate. The 112 now follows that style (including a three-ply, as opposed to single-ply, scratchplate material) and immediately the guitar looks less generic with more of the hot-rod vibe that's so much a part of the original Pacifica design and concept. The 112 is far from fancy and simply concentrates on the bare necessities. Yet the construction is of excellent quality. We received a two-tone sunburst guitar to evaluate and the matching of the body pieces - two or three, we're honestly not sure - is extremely good, as is the finishing. Only the very noticeable forearm contour to the body looks a little out of place - a more curved transition wouldn't distract from the clean, modern design. The maple neck has a very thin satin finish - it almost feels like it's been oiled - and is tidily mounted to the body with the standard four screws and neck plate. The neck is well shaped, a full-ish 'C' that feels thinner in depth than it actually is. Fretting is excellent from a medium size wire (approx 2.37mm wide x 1.36 high); the ends of the slots are filled, the side edge of the fingerboard is slightly curved, just like an old Fender, not straight like so many low-end guitars. There's even a little rounding to the top edge of the fingerboard. It's not quite James Tyler, of course, but it's very clear that someone cares and, importantly, understands what a good electric guitar should feel like in the hand. But perhaps most importantly the neck is really solid and stable, there's minimal whip. Trust us, if looked after this will be a guitar for life. The original Pacifica six-in-a-line headstock has lasted well and still looks good some 14 years on. A simple silk-screened script logo dominates the functional, square Yamaha logo and the company's 'tuning fork' emblem is thrown in - just in case you don't already know you're playing a Yamaha! A subtle change to the pretty standard vintage vibrato design is the addition of block saddles intended to add a little firmness to the tone. They also give a precise break-point for the string. The saddle height adjustment screws are all the same height and those on the outer saddles protrude - using shorter screws would be dead easy and solve the problem. It remains a basic unit, however, with screw-in arm and no tension adjustment; the block is deep-drilled to lose dead string length and, in theory, help with tuning stability; it's also heavily contoured - typical of the modern rock guitars of the late eighties/early nineties. We can't help thinking that more mass from a standard vintage-style steel block and maybe a push-in arm would be more suitable. Also, the vibrato coverplate has six individual holes for string access whereas one large hole is faster for string changes. According to Yamaha the pickups have been upgraded, in line with other Pacifica models, with Alnico V-loaded pickups. "They used to be ceramic-loaded pickups," confirms Yamaha's Julian Ward. "We wanted to get that Alnico tone specifically for this guitar but still create a vintage/modern sound. The Pacifica does have its own character - it's not the most unique - but where it fits is that it's hugely versatile. It's not overly vintage but it's not a super slim-neck rock axe with active pickups either - by design it sits in that middle ground." Also new is a coil-split facility for the bridge humbucker - activated by a pull/push switch on the tone control - and even the knobs have received a makeover; they're now chromed and knurled metal: classy. The icing on the cake, of course, is that this £199 Pacifica blows the socks off a vintage Fender, right? Wrong. By design it's an altogether more modern, brighter and lighter take on a hot-rod Strat. But when we say brighter that doesn't mean overly shrill. In fact the bridge humbucker will surprise some, it's beefy without being too mid-range heavy and although the coil-split, which voices the screw-coil, proves a little bland played clean, with a distortion boost it's a pretty useful gnarly and wiry rhythm voice. It's good to have the choice too when mixed with the middle pickup - switching between the full and split coil here is subtle but, especially with cleaner 'class A' amp voicings, there's enough character difference to be useable. The solo single-coils impress - plenty of percussion and with a little mid-range beef added from the amp these get you to the correct Texas toneland. Neck and middle combined produces a fine modern Strat-like mix - the added brightness will cut through a multi-FX patch nicely. Hum- cancellation is good too - only the lone single-coils will pick up hum, while any mixes and obviously the full bridge humbucker are nice and quiet. On the down side the tone control gets too muddy fully off; perhaps a different value capacitor could nail a more Clapton-esque 'woman' tone. The volume taper, however, is excellent and ideal for subtle changes and smooth violin effects. The vibrato can lead you into tuning stability problems but that's the nature of the beast; used for more old-school shimmer it adds a lot (and stays in tune) but don't expect, without some additional tweaking, for things to come back spot-on in-tune after a bout of heavy down-bending.